Less frequently, men can lose their hair due to stress, hormonal imbalances and some medical conditions. Nu Hair Clinic can help, we offer the best hair transplants and non surgical hair loss remedies for men in clinics across the UK. Women lose their hair for a number of reasons including hormones, stress and medical conditions such as alopecia or hypo or hyperthyroidism. 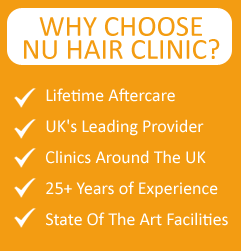 Nu Hair Clinic can help, we offer the best hair transplants and non surgical hair loss remedies for women in clinics across the UK. I seem to be losing hair every day. Is this normal? We normally lose about 150-200 hair every day, the vast majority of these will be replaced within 12 weeks. Hair loss normally comes in cycles, so sometimes it can be quite noticeable but in most cases, it is completely normal and does not represent long term hair loss or balding. If you’re concerned about hair loss or you’ve noticed areas of hair thinning, you may want to book a free consultation with our expert hair loss doctors at one of our clinics in London, Leeds, Liverpool, Manchester or Nottingham. Each hair on our body has a “lifecycle”. For head hair, the life span is between 2 and 6 years, growing about 1.5cm per month. After the 2-6 years of growth, it has a resting phase before finally falling out. This hair should normally be replaced by a new hair, however, in baldness, the hair is not ever replaced. Should I take medication or have surgery? There are pros and cons to both options which will be fully explained to you at your free consultation however ultimately, the choice is yours. In trails, surgery has a better success rate. To discuss this more thoroughly, you may wish to book a free consultation with one of our expert hair loss surgeons at one of our clinics throughout the UK. Will a hair transplant prevent hair loss? No, a hair transplant will not prevent future hair loss, however transplanted hair is permanent. Future hair loss can be prevented or slowed by using various medical hair loss remedies such as laser, or medications. If you’re interested in hair transplants and would like to find out more, you may want to book a free consultation with our expert hair loss doctors at one of our clinics in London, Leeds, Liverpool, Manchester or Nottingham. There are many factors which influence if a hair transplant is successful, and each person is assessed on an individual basis. During your free consultation, your expert hair loss surgeon will assess and explain if you would be a good candidate for a successful hair transplant. If a hair transplant is unlikely to be successful for you, your doctor will explain and suggest alternative options for you to consider. How soon will hair grow after a transplant? Every individual experiences different hair growth following transplantation, however, as a rule of thumb, new hair growth normally occurs 4-6 months after transplantation and cosmetic coverage by about 12 to 18 months. Sometimes, results can be expedited by use of medications. This will be explained to you at your free consultation with your expert hair loss surgeon. How soon after the procedure can I was my hair? You can wash your hair very gently the day after the procedure with a shampoo and water solution. You should wash your hair daily in this fashion for a few weeks after the procedure. What activities should I avoid after a hair transplant procedure? Any strenuous physical activity should be avoided for two weeks after the procedure and then slowly reintroduced. A full list of do’s and don’ts will be provided to you after your procedure as part of your hair transplant lifetime aftercare provided by Nu Hair Clinic. We recommend taking at least a week off work following your procedure, possibly more if your work is very strenuous. What are the risks of hair transplant surgery? – Swelling to the face – swelling to the forehead is quite common following the procedure, particularly if the transplant has been at the front hair line or temples. Rarely, swelling can occur to the whole face, but this normally dissipates within 1 week. All potential risks and complications will be fully explained to you at your free consultation with your expert hair loss surgeon. Yes, transplanted hair follicles are only detectable under a microscope, so only those people who you choose to tell will be those who know! Can I decide where I would like my hairline? 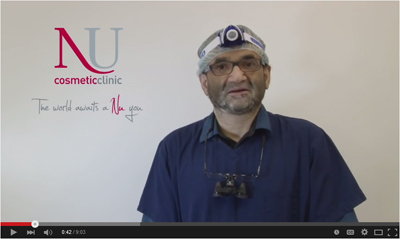 At Nu Hair Clinics, we work very hard to tailor the surgery to the needs of the client. We will work with you to try and achieve a look which is both achievable and natural. Unfortunately, not all clients’ needs are always achievable; however we will always be honest and open with you, so that you can make the decision which is right for you. If you would like to discuss your hair transplant aims fully, you may wish to book in for a free consultation with one of our expert hair surgeons at our clinics in Liverpool, Leeds, Manchester, London or Nottingham. Is it possible to transplant a full head of hair? Unfortunately, if a person has no hair on the head, we will be unable to perform a successful hair transplant, however, other options may be available such as medications. To fully discuss your hair loss options with a hair loss surgeon, you can book a free consultation at one of our modern clinics in London, Leeds, Manchester, Liverpool or Manchester. Will I lose any of the transplanted grafts? Normally about 1% loss of grafts is expected, which makes very little difference to the overall effect. Is Minoxidil (Rogaine) suitable for women? Yes, Minozidil (Rogaine) can be used safely and successfully by women suffering from hair loss. Women cannot use Propencia (finasteride) due to its association with birth defects. For a full explanation and exploration of different medical options to treat hair loss, you can book in for a free consultation at one of our hair loss clinics in Manchester, Leeds, Liverpool, London or Nottingham. When should I start to use hair loss medication? Really, the sooner the better! We advise that as soon as you notice hair loss or thinning, you should consider using restorative medication as this gives it the best chance of success. What will happen if I stop taking hair loss medication? If you cease taking hair loss medication, your hair loss will return at the rate that it did before you started taking the medication. We therefore recommend that you continue to take hair loss medications for as long as you wish to stave off hair loss.